It’s time to SCALE those results. A complete video marketing strategy will enable you to get your video in front of more potential customers and attract more leads by combining the power of your video with the latest Digital Marketing strategies. When implemented by a professional Digital team – whether it be ours or yours – it can actually be quite simple, and highly scalable. At the start of your Visionary Animated Explainer Video project we will define your target market, and their mindsets, in detail. Together, we’ll mastermind specific details about your “target market” – the decision maker we want the video to inspire. We’ll discuss details such as their age, location and job title for example. But we’ll take it much further than this. We want to understand the way your target market thinks about the problems you solve. What’s running through their mind? We want to know how aware they are of their problems, and how much they know about the solutions you offer. And we’ll discuss their current behaviours and thought patterns. All of this information enables us to build a video which will resonate deeply with the EXACT type of customers you want to attract to your business. For a full understanding of what we discuss during the Visionary Strategy Session at the start of your project, see our article here. 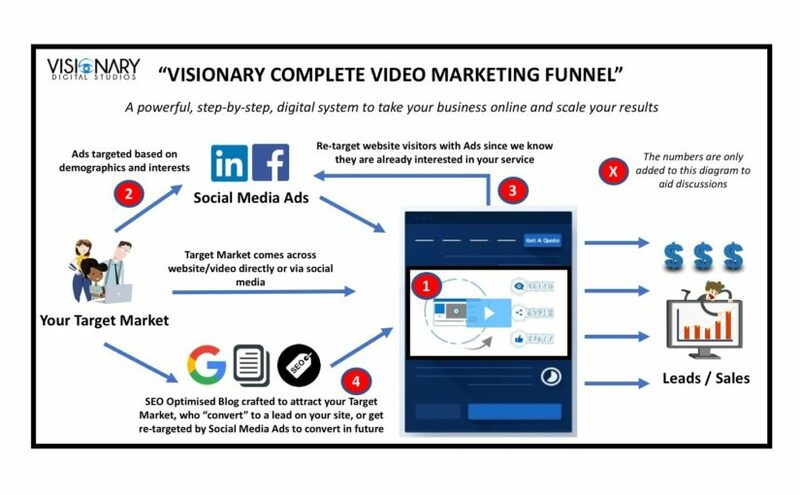 Refer to bullet point 1 on the“Visionary Complete Video Marketing Funnel” diagram below. If you’re reading this, chances are you already understand the power of Animated Explainer Videos in attracting leads online. If you’re not quite across this yet, see some scientific studies here , or understand why Explainer Videos are so effective here . – The video makes all of the other marketing and sales strategies you implement more effective. – This initial project gives us an opportunity to assess your target market, brand, unique value proposition and overall marketing vision. From there we can craft a message that attracts the EXACT type of customers you want to your business. – It allows us to achieve short term results for you and build a strong relationship, while we’re building out your longer term marketing strategies. Refer to bullet point 2 on the“Visionary Complete Video Marketing Funnel” diagram below. Once we’ve produced your video and implemented it into your website, then ANYONE who gets to the website will understand the REAL value of your service. The video will be specifically crafted to inspire your EXACT target audience to action. So, a percentage of the people that get to your website and watch the video will be moved to request a call from your sales team or take the next step in your sales process. Now, we can scale the amount of potential customers that see your video using powerful Social Media Advertising. Generally, we’ll use Facebook or LinkedIn, depending on what is most effective for your target market. These social media platforms allow us to use your Visionary Animated Explainer Video as Ads in the newsfeed. And because Animations are unique compared to everything else viewers are seeing in their newsfeed, they attract attention from fast-scrolling social media users. A certain percentage of viewers on Facebook or LinkedIn will click on the ad, and come through to your “Landing Page” (a page on your website designed specifically to sign up new leads). Here they can view your video, learn more about your company’s services, read your success stories and learn from your content. And they’ll have the chance to request a call from your sales team via the “Contact Us” button on your website. In the background, The Visionary Team will be continually optimising your social media Ads and your website, so that we can get the most leads for your business possible, for the cheapest price possible. – how much it costs to get each user to click your ad AND also request a call from your sales team (“Cost Per Lead”). In summary – you now know how much it costs you to attract leads to your business. Now … you can start scaling your advertising spend to attract as many leads as you desire to your business. Refer to bullet point 3 on the“Visionary Complete Video Marketing Funnel” diagram below. When people get to your website and watch your video, a certain percentage will request a call and become a lead in your business. But, attention spans are short these days, and people have A LOT on their mind. Especially the senior decision makers you are targeting as customers. So, even if they have watched your video and are interested in your service, most website visitors simply won’t request a call and become a lead straight away. However, we can assume that most people who are on your website are at least interested in speaking to your sales team at some stage. So, using Facebook or LinkedIn Advertising functionality, we can “retarget” Ads at anyone who has landed on your website in the last 6 months. This ensures that you are still at the forefront of their mind for up to 6 months. It often takes a few times of seeing your advertising before someone finally decides to enquire for more information. Alternatively, you can rest assured that whenever they’re ready to take action on a service like yours, you’ll be the first brand that is in their mind because they have been seeing your Ads on their social media feed. Retargeting is a very powerful and cost-effective Digital Marketing strategy to increase your results with online lead generation. 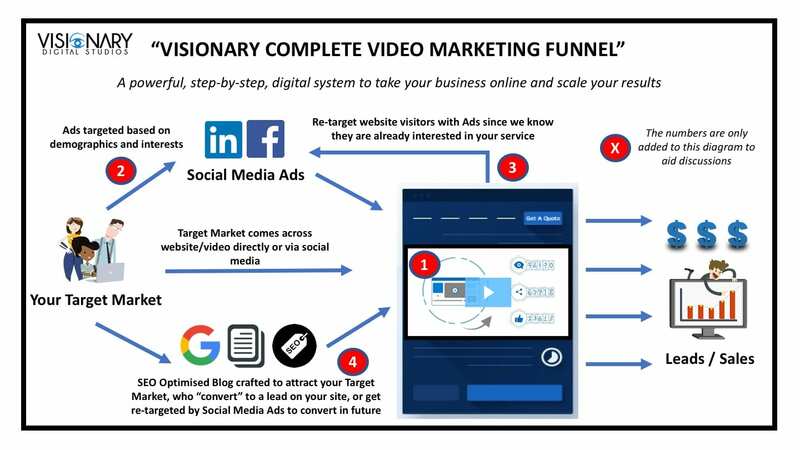 Refer to bullet point 4 on the“Visionary Complete Video Marketing Funnel” diagram below. All established companies should have a professional blogging and SEO strategy for their long term marketing goals. Blog articles should be used throughout your marketing, sales and delivery processes to educate and provide value to your customers and your network. In this article, we are focussing on using blogging specifically for marketing and lead generation. You’ve undoubtedly heard of SEO, because you have obscure “companies” from obscure countries sending your emails and LinkedIn requests at obscure times asking you about SEO! Let’s talk about how blogging and SEO works at a high level. Your target market – the one we defined in detail during the “Initial Preparation & Strategy” phase of your project – are using Google to search for information on how to address their problems every day. So, to attract more of your target market to your website, our Digital Strategists will research EXACTLY what they are searching for in Google. Then, we’ll combine our writing skills with your industry knowledge to craft blog articles that provide excellent responses to their questions. This attracts your target market to your website and positions you as an authority in your industry. While on your website, after they have read your articles, they have a chance to learn more about your work, watch your Animated Explainer Video and hopefully request a call and become a lead. However, even if they don’t become a lead immediately … they will now be retargeted by our Facebook or LinkedIn retargeting ads discussed in the “3 – Retargeting Social Media Advertising” section of this article. They’ll see your Video Ads in their newsfeed for the next 6 months. So, they will be frequently reminded about your brand. 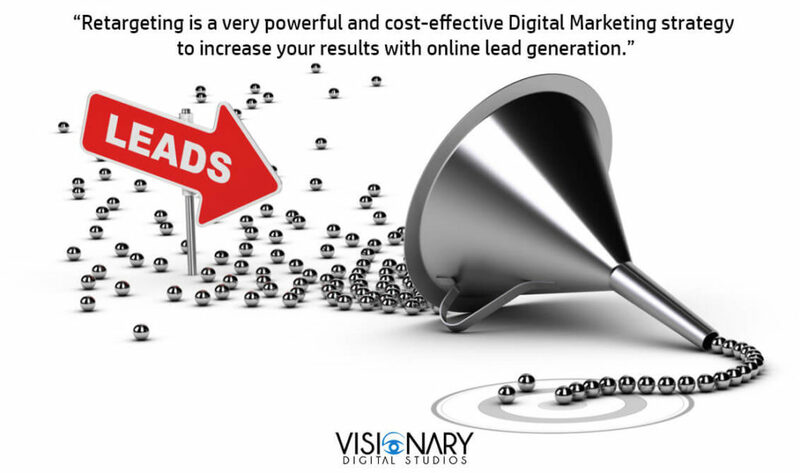 Every time they see your Ad, there is potential for them to decide to click, and become a lead in your business. So, to compete powerfully we use an ongoing process of SEO (“Search Engine Optimisation”). Since Google is continually updating the algorithms that define what websites show first in searches, a professional SEO team will continually stay up to date with the latest digital techniques and work behind the scenes to ensure your target market is attracted to your website before your competitors. By now, you can see the power of each individual component of the “Visionary Complete Video Marketing Funnel”. When each component works together, they drive more of your target market (more “traffic”) to your website and bring more leads and more sales to your business. Is this system really effective? Could it really work for my business? At Visionary, we practice what we preach. The “Visionary Complete Video Marketing Funnel” is the exact same system we have used and optimised continually in our own business. The reason you are reading this article is because this exact system has attracted YOU to our website and inspired YOU to be interested in our service. So, if you’re ready to see how this system can work in your business, request a call with a Visionary Video Strategist by filling out the form below. Let’s discuss where you’re at, what results you can realistically expect, and what’s involved in the process. But if you’re not quite ready yet … no problems!